It is widely acknowledged that every person in the United States does not face the same treatment from law enforcement. The color of a person’s skin or the neighborhood that they’re from regularly impacts communities, often through legal means that have since been deemed discriminatory and prejudicial. Especially in recent years as minority populations, particularly African-Americans, have been needlessly killed by police officers when they were mistaken for someone committing a crime, this is an extraordinarily important and current issue. When police officers are themselves from such backgrounds, their experiences can be infinitely more complicated and problematic. This documentary begins by covering the history of false arrests and illegal quotas in New York City, and how these practices have been officially outlawed after being standard practice for many years. 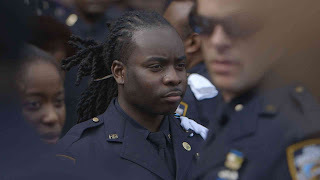 A group of NYPD officers, who become known as the NYPD 12, come forward as whistleblowers to recount how their performance reviews were skewed negatively because they refused to make arrests based on arbitrary or deliberate orders that targeted minority populations and demanded results that led to harassment and unnecessary hardship for those stopped or arrested just to fulfill a quota. As the officers try to ensure that justice is served and their careers are not in jeopardy, a private investigator works to exonerate someone falsely arrested and serving time for no reason. The NYPD 12 have a number of obstacles placed in their way, including threats of punitive actions and public assertions that they can’t be objective in their police work and are far too lenient on potential suspects who look like them. That makes this uphill battle all the more inspiring, since they truly want to change a system that most agree is broken. Though highly-publicized incidents like the death of Eric Garner are mentioned, this is not a film that deals with the oppositional stances of the Black Lives Matter movement and the Blue Lives Matter police response, but instead one that universally decrees that pre-judging anyone and requiring the attainment of statistics is a self-fulfilling prophecy that does no one any good. This topic has been addressed recently in narrative films such as “Monsters and Men” and “Monster,” and in a different way in Spike Lee’s period piece “BlacKkKlansman.” Seeing how it works in the real world without any theatrics, when the police officers must stick to their convictions no matter how much pressure they endure and the private investigator has to simply press on and try to keep his client’s spirits up. This is a vital, disturbing account of what is happening in one of the most liberal areas of the United States, and hopefully showcasing it in film festivals and to audiences via Hulu will make this conversation even more prominent and start to end this epidemic.